Whilst developing the eating and drinking resource, we tried it out with people with a range of eating and drinking difficulties. I talked to Ellie, who had swallowing difficulties following a stroke. She found it really helpful to use the mats to think about different aspects of meals (mealtimes, where you eat and the process of eating). 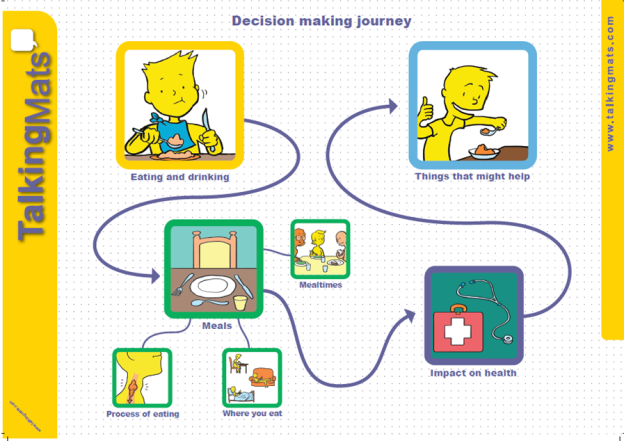 Ellie had very good insight into her eating and drinking difficulties and had developed clear strategies to help manage them. She found breakfast and snacks the most difficult meals to manage. She was also very clear that pureed and soft moist foods were the safest and easiest for her. After we had done the mat, Ellie reflected on her eating and drinking, saying that it was limiting but that she could see that things had improved. One of the most difficult things for her was the impact of her swallowing difficulties on some of the social aspects of eating. She really misses going out for a meal with family and friends, something that we often take for granted. Doing the ‘meals’ mat helped Ellie to see that although she still has many difficulties, mealtimes have become less stressful. For example, although eating and drinking is still a long, slow process, Ellie and her family have adapted to this and now manage ok, especially if they plan ahead. Some useful action points were also identified for the professionals working with Ellie – it would be good for her to have suggestions about a greater range of breakfast options as well as a variety of snacks which she could eat between meals. Using the mats really helped to clarify the progress that Ellie has made with her eating and drinking since her stroke. This entry was posted in Blog, Communication difficulties, Eating and drinking, Participation, Self management, Talking Mats principles and tagged Dyspagia, Eating and Drinking, goal setting, Participation, stroke, Talking Mats on December 5, 2014 by Sally Boa.